When we think of the mountains, my family thinks of hiking in the Colorado Rockies and camping — Oh yes! Today we’re going to be looking at childrens camping books! 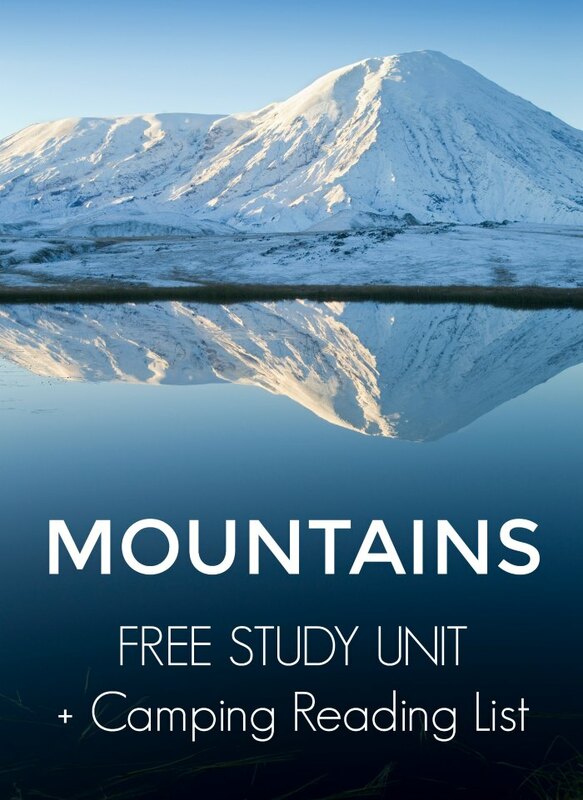 In addition, I’ve partnered up with some fellow bloggers to offer some terrific mountain unit study resources you can use in the classroom, your homeschool or just enjoy with your child. 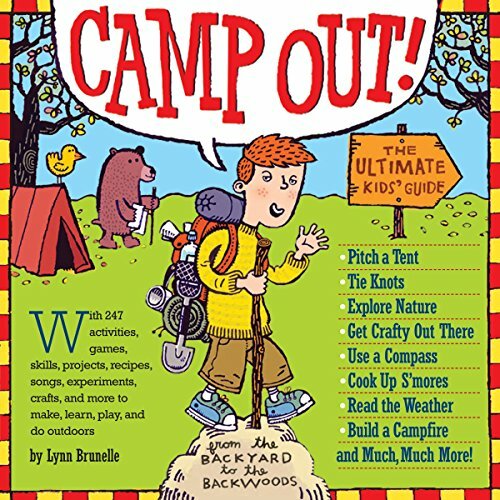 You can find these children’s camping books at your local library or purchase through the affiliate links provided for your convenience. 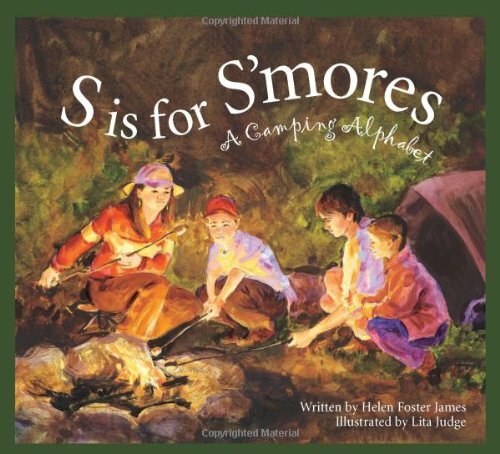 S Is for S’mores: A Camping Alphabet (Alphabet Books): Next to baseball and fireworks on the Fourth of July, nothing else seems as American as the family camping trip. From what to pack, where to go, and what to do when you get there, S is for S’mores: A Camping Alphabet takes readers on an A-Z trail exploring this outdoor pastime. Veteran camper Helen Foster James tackles topics such as unique camping environments, equipment necessities, famous conservationists, and national parks and other attractions. Whether your idea of “roughing it” is a blanket in your own backyard or the subarctic ecosystem of Alaska’s Denali National Park, S is for S’mores is a fun and informative guide that is sure to help campers of all ages make the most of their wilderness adventures. 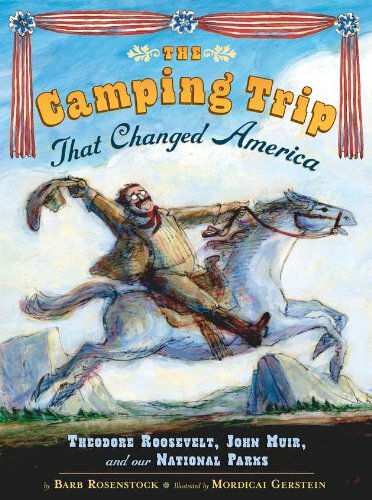 The Camping Trip that Changed America: Theodore Roosevelt, John Muir, and Our National Parks: Caldecott medalist Mordicai Gerstein captures the majestic redwoods of Yosemite in this little-known but important story from our nation’s history. In 1903, President Theodore Roosevelt joined naturalist John Muir on a trip to Yosemite. Camping by themselves in the uncharted woods, the two men saw sights and held discussions that would ultimately lead to the establishment of our National Parks. 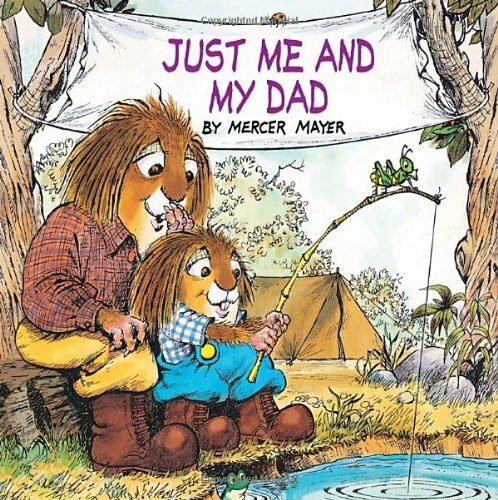 Just Me and My Dad (Little Critter): This well-loved Little Critter picture book has become a modern classic. It’s the tale of a father-and-son camping trip filled with Little Critter’s mistakes and good intentions. In spite of difficulties, however, the happy father and son manage to put up their tent, catch fish for dinner, and sleep beneath the stars. In spite of minimal text, the story is full and rich, with endearing illustrations from start to finish. 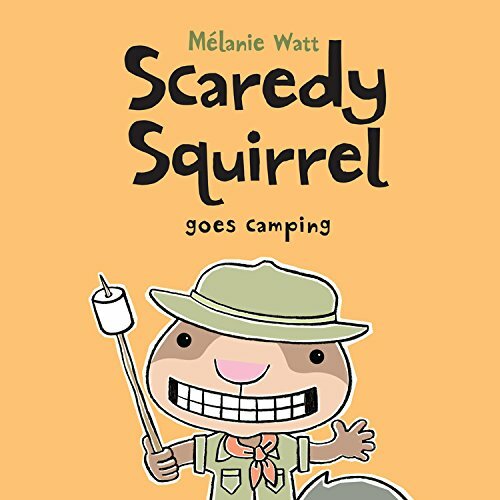 Scaredy Squirrel Goes Camping: Scaredy Squirrel is not too comfortable with the idea of camping … unless it’s on his couch! There will be no mosquitoes, skunks or zippers to worry about when he watches a show about the joys of camping on his brand-new TV. But first Scaredy must find an electrical outlet, and that means going into the woods! Will the nutty worrywart’s plans prepare him for the great outdoors, or will his adventure end up as a scary story told around the campfire? Flashlight: Inside a tent it’s cozy. But what is going on outside? Is it dark? Is it scary? Not if you have your trusty flashlight! Told solely through images and using a spare yet dramatic palette, artist Lizi Boyd has crafted a masterful exploration of night, nature, and art. 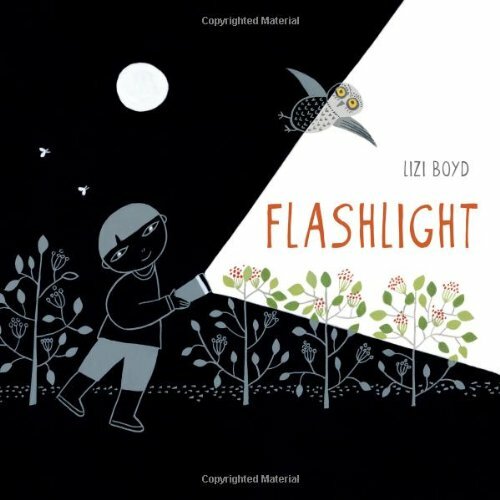 Both lyrical and humorous, this visual poem—like the flashlight beam itself—reveals that there is magic in the darkness. We just have to look for it. Camp Out! : The Ultimate Kids’ Guide: Bear bags, wilderness showers, and telling the temperature by counting the cricket chirps… Whether you’re planning an over night in the backyard or a weekend in the wilderness, this book is packed with stuff to know. The basics, from gearing up to choosing a site to building a tarp tent. Tasty outdoor recipes: Solar Oven Pizza, Chow Down Chili and s’ more’s of course—with 8 variations. Plus, how to keep a Field Journal, exploring the nighttime sky, creepy campfire stories, and when it’s time to go home, leaving no trace. It’s everything you need to pick up and head for the hills. 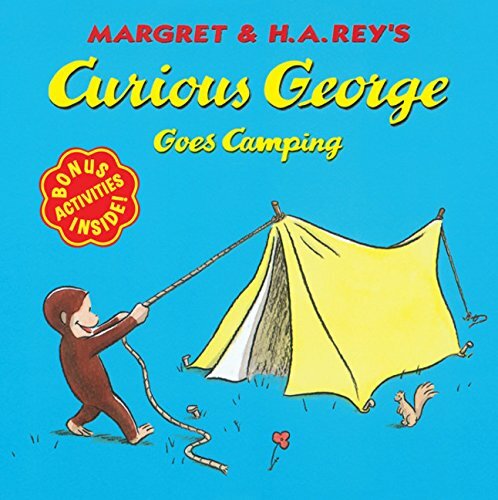 Curious George Goes Camping: Curious George Goes Camping is an entertaining story of the Great Outdoors based on H. A. and Margret Rey’s popular primate and painted in the original watercolor and charcoal style. George tries to be helpful, but he of course just ends up upsetting a nearby camper. As he’s hiding in the woods, he meets a forest creature who catapults the mischievous monkey into a chain of even more outrageous events! 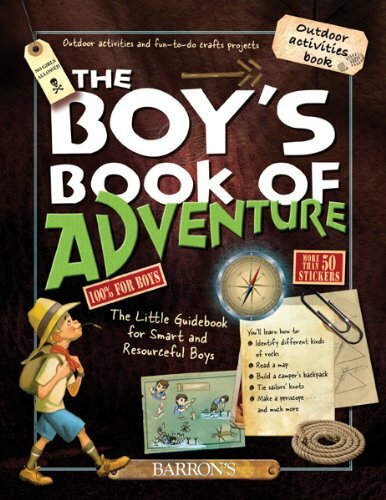 The Boy’s Book of Adventure: The Little Guidebook for Smart and Resourceful Boys: Here’s an exciting book packed with facts about nature, ideas for outdoor activities, and fun-to-do crafts projects that will keep boys interested and busy all year around. Camping advice and instruction includes ways to protect against the weather, first-aid for injuries, advice on using a compass, tips for studying the night sky, identifying birds, and much more. The book’s wide array of topics and sturdy construction makes it an ideal outdoor companion for hiking and camping excursions. 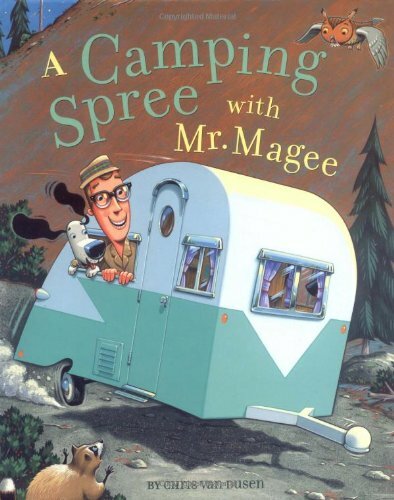 A Camping Spree With Mr. Magee: Mr. Magee and his trusty dog, Dee, are enjoying a peaceful camping trip when all of a sudden they find themselves plunging down a mountain and teetering on the edge of a huge waterfall! How will they find their way out of this slippery situation? Chris Van Dusen, the creator of Down to the Sea with Mr. Magee, has filled this new adventure with charming illustrations and a playful, rhyming text. A fun read-aloud for children (and adults!) on campouts or snuggling at home! Our Great Big Backyard: To help commemorate the one hundredth anniversary of the National Park Service, #1 New York Timesbestselling authors former First Lady Laura Bush and her daughter Jenna Bush Hager have created an exuberant picture book tribute to our national parks and the importance and fun of connecting with nature. 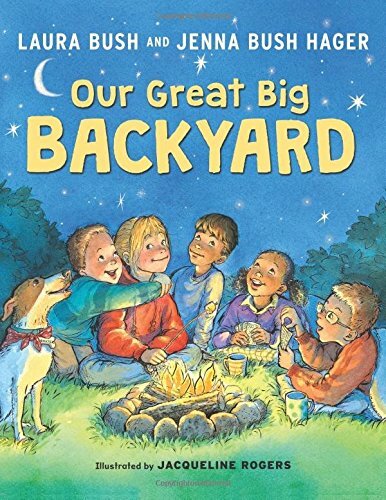 Our Great Big Backyard follows Jane, whose plans of spending the summer playing video games with her friends are dashed when her parents announce that her family is going on a road trip to national parks around the country. Yet somewhere between the Everglades and Big Bend National Park, things begin to change. Jane starts paying attention to the magnificent sights and spends less time looking at her screen. The stunning views open up her imagination as she and her brother see everything that nature has to offer. And the more Jane discovers, the more she realizes how much there is to love about the outdoors—whether she’s in a national park across the country or right in her own backyard. 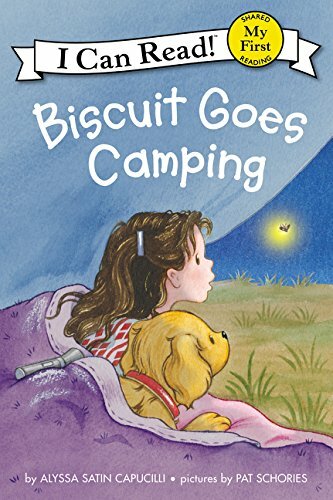 Biscuit Goes Camping (My First I Can Read): Biscuit can’t wait to go camping! From tents and flashlights to frogs and fireflies, there are so many new things to discover when you’re sleeping outdoors. But are those rain clouds in the sky? How will Biscuit go camping now? 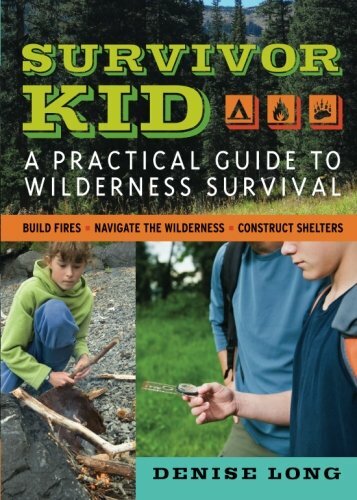 Survivor Kid: A Practical Guide to Wilderness Survival: Anyone can get lost while camping or on a hike and Survivor Kid teaches young adventurers the survival skills they need if they ever find themselves lost or in a dangerous situation in the wild. Written by a search and rescue professional and lifelong camper, it s filled with safe and practical advice on building shelters and fires, signaling for help, finding water and food, dealing with dangerous animals, learning how to navigate, and avoiding injuries in the wilderness. Ten projects include building a simple brush shelter, using a reflective surface to start a fire, testing your navigation skills with a treasure hunt, and casting animal tracks to improve your observation skills. 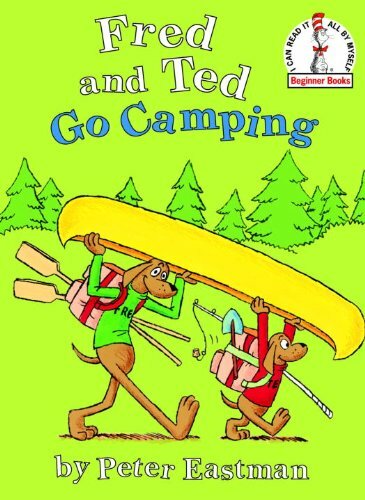 Fred and Ted Go Camping (Beginner Books(R)): Fred and Ted—beloved canine stars of P. D. Eastman’s Big Dog . . . Little Dog—are back in an all-new Beginner Book written and illustrated by P. D.’s son, Peter Eastman! In this story Fred and Ted go camping, and as usual, their uniquely different approaches to doing things (such as packing equipment, setting up camp, and fishing techniques) have humorous—and sometimes surprising—results. A charming introduction to opposites that beginner readers will find ruff to put down! 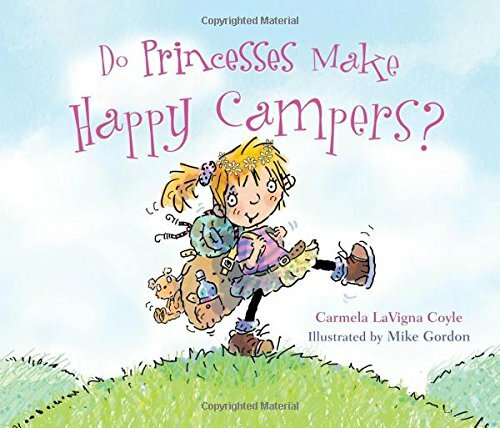 Do Princesses Make Happy Campers? “How come the campfire crackles and roars?” “I think it’s requesting that we make s’mores!” Join our favorite princess as she and her family camp, hike, fish, and bicycle in the great outdoors. Through rain and sunshine, fairy houses and fishing, this happy camper discovers that lots of fresh air and looking on the bright side are all a girl needs to make her a princess. 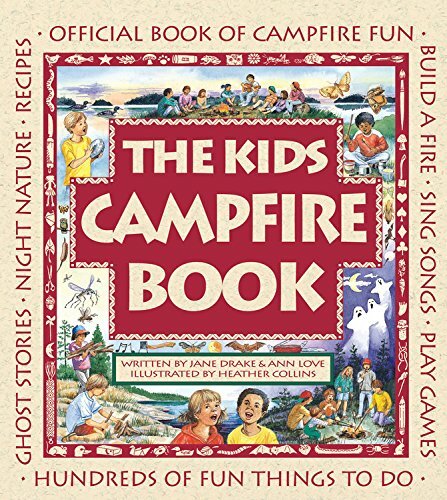 The Kids Campfire Book: Official Book of Campfire Fun (Family Fun): This book in the Family Fun series has everything you need to know about having a fun and safe campfire. This collection of outdoor activities, games, stories, songs and more is for kids and families to share around the campfire. It includes tips on how to find the best campfire site, identify animal cries at night and locate constellations. Kids will also find out how to make pizza over an open fire, tell a spooky ghost story, or create musical instruments for a sing-along. With more than 125 pages of fun things to do around a campfire, this is the perfect book for every camper, canoeist and camp counsellor! 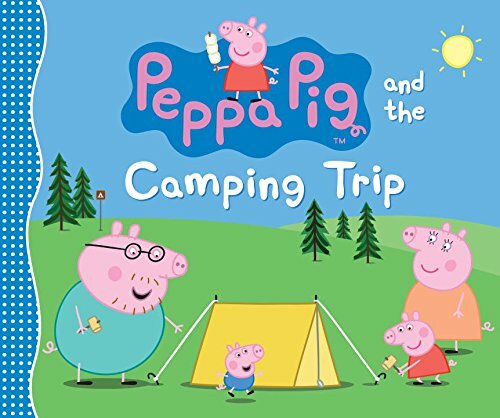 Peppa Pig and the Camping Trip: Peppa Pig and her brother, George, are very excited. They’re going on vacation! This time Daddy Pig has borrowed a camper van that has its own sink and beds and a roof that lifts up. It also turns into a boat they can take on the river. Even more fun are the nature activities Peppa enjoys with her family, like visiting swimming ducks, spotting wildlife on their walks, building a campfire, and pitching Daddy’s old tent. But best of all are the shooting stars they see in the night sky as they’re falling asleep! 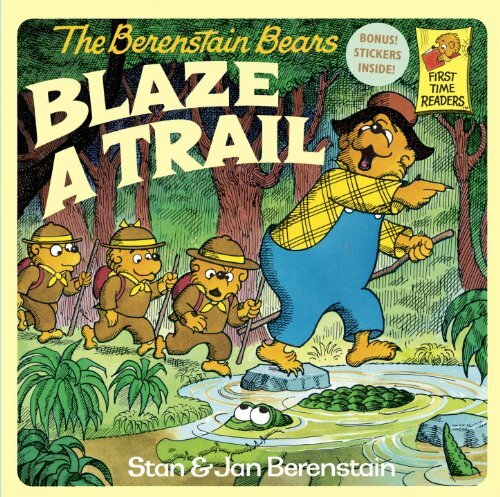 The Berenstain Bears Blaze a Trail: Brother, Sister, and Cousin Fred are ready to set out on a Bear Scout adventure. However, when Papa joins the trio, things end up becoming a bit of a mishap. This beloved story is perfect for fans of all things funny and adventurous. Includes over 50 bonus stickers! Like these childrens camping books? Find even more engaging book lists for kids with more than 100 book-themed reading lists! 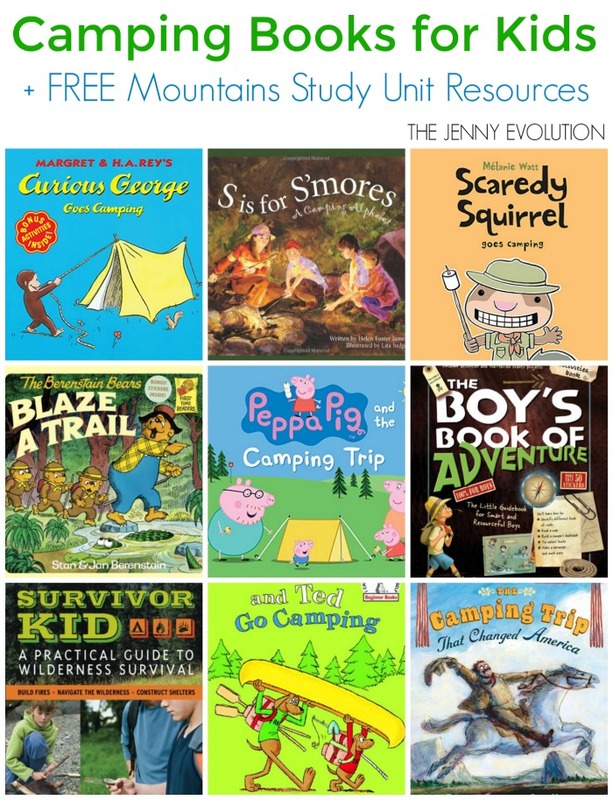 In addition, I’ve partnered up with some fellow bloggers to offer some terrific mountain unit study resources you can use in the classroom, your homeschool or just enjoy with your child. These unit study resources may contain affiliate links. Mountain Shape Do a Dot Mats from Look! We’re Learning!